Don’t you agree that Melampodium divaricatum has such delightfully cheerful faces? 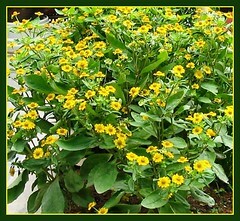 It is one of the most prolific summer bloomers and gaining much popularity, similar to the Marigolds and Zinnias. Botanical Name: Melampodium divaricatum (synonym: Dysodium divaricatum, Melampodium paludosum). 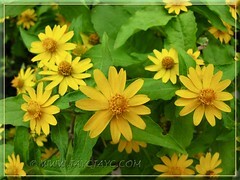 Common Name:Butter Daisy, Melampodium, Star Daisy, Gold Medallion Flower. Plant type: An ornamental flowering annual, native to tropical and sub-tropical regions that include Central America, Southwestern United States, the Caribbean and South America. 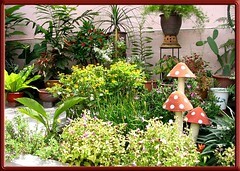 Moisture: Needs regular watering and moderately. It can be drought and heat tolerant once established. Propagation: Can be easily propagated from seeds that can be harvested in abundance easily. Or better still, allow it to self-seed which it does prolifically in optimum growing conditions and then plant seedlings wherever you desire. Features: Melampodium divaricatum is a herbaceous flowering annual growing between 1-2 feet tall and 0.75-1 foot wide, and quite compact in habit. 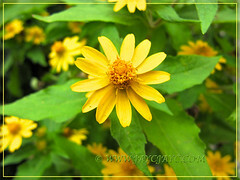 It produces solitary butter-yellow daisy-like flowers (about an inch wide) with darker orangy-yellow centers above leaf pairs from an early age, that eventually cover the whole plant as new stems branch out. 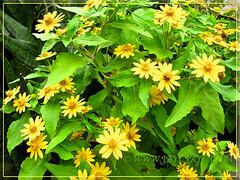 Leaves are bright green, entire and oblong, and combines beautifully with the perky yellow blooms. Usage: Butter Daisy is excellent for planting en masse in beds and borders, or used as groundcovers or even grouped with other summer flowering annuals and perennials. Being compact and small in stature, Melampodium divaricatum is very ideal for container gardening to brighten any garden spot, patio or deck. Their flowers are known to be used in anti-inflammatory preparations in some regions. 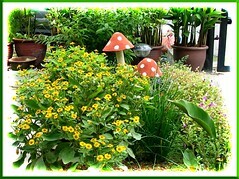 Care: Butter Daisies are such low maintainence annuals. When located in sunny sites and with consistent watering, they’ll delight you with a continuous profusion of golden yellow blooms the year round or from summer to early frost. Deadheading is not required, though you may want to harvest seeds for next year’s planting. Frankly, we don’t even fertilize, yet they always appear fresh and blooming non-stop in our tropical climate. Quite susceptible to powdery mildew, whiteflies and tomato spotted wilt virus that can destroy the plant if untreated, so do watch out for them. For temperate zones: Hardiness – USDA Zone 5-10. More information here. Regarding seed propagation, sow seeds directly in the garden after last frost date. For earlier bloom, start seed indoors 6-8 weeks before last frost date. Seedlings or purchased plants too can be set out after last frost date.